Fermented horseradish is the perfect condiment to serve with your prime rib (or steaks) this Christmas or New Year’s! The enzymes created during fermentation of this tasty condiment help your body digest the meat and the other rich items that will accompany your meal. Meanwhile, friendly bacteria that is created during fermentation feed your microbiome. 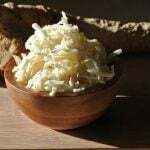 Horseradish by itself is also extremely health promoting and the fermentation process just makes these nutrients more bioavailable to you (available for your body to use). Let me break it down for you. 1/2 packet of starter culture (I use this one). Next, grate the horseradish root. I used the grater function on my food processor, but you can do it the old fashioned way as well. Pack your sterilized mason jar with your shredded horseradish. Be sure to leave an inch of headspace to allow for any expansion during fermentation. Then pour the culture/water over it. Add your fermentation weight (or sterilized rock) and then top the jar off with filtered water to cover it. Finally, after putting an airlock lid (or regular mason jar lid) on your ferment, set the it on your counter out of direct sunlight for at least 3 days. I like mine when it has fermented for about 1 week. Keep tasting it out after the 3 day mark to see when it gets to your liking. Finally, use or refrigerate. Your ferment will keep for months, but it will continue to ferment (albeit slowly) while under refrigeration. It may become more spicy or less spicy. I have had both happen! Fermented horseradish is not only delicious, but is also full of enzymes, friendly bacteria, and nutrients to get your digestive juices flowing. Have you ever eaten fermented horseradish? Have you ever made your own? Previous Post Cranberry Kraut: Lower inflammation and feed your microbiome. Yum! My hubby and I are looking forward to making more fermented foods, and this is definitely going to be on the list! It looks amazing! That’s a great idea, just who is going to grate the horseradish for me? I think I am going to buy the food processor you suggest. This sounds so good! I really want to start fermenting, but I just haven’t done it yet! It is definitely on my to-do list! Fermented food is so esssential for our health! Thanks for sharing will have to try this! Wow, I love horse radish but had no idea it was so good for you😃 can’t wait to try this!